SM Malls in Marilao, Pulilan and Baliwag welcome new stores to bring good news to shoppers looking for more options and shopping fun. HAPPY SKIN AT SM CITY MARILAO. Proudly Filipino brand, SM City Marilao welcomes Happy Skin to its arsenal of beauty brands. Happy Skin offers must-have make-up and skin care products that are just right for the Filipino complexion. Owned and managed by model Rissa Mananquil-Trillo and marketing expert Jacqe Yuengtian- Gutierrez, the beauty brand uses skin-friendly ingredients such as Japanese tea leaves and collagen. The goal of the owners is create “skin-caring” makeup products inspired by beauty needs and backed by research. Happy skin products are all made with good-for-you ingredients and come in chic packaging. Its signature cheeky names such as Shut Up & Kiss Me Moisturizing lips and Don’t Get Mad, Get Even powder foundation line would definitely put a smile on your face. Support local and visit this homegrown beauty brand located at the ground floor of SM City Marilao. STARBUCKS AT SM CENTER PULILAN. 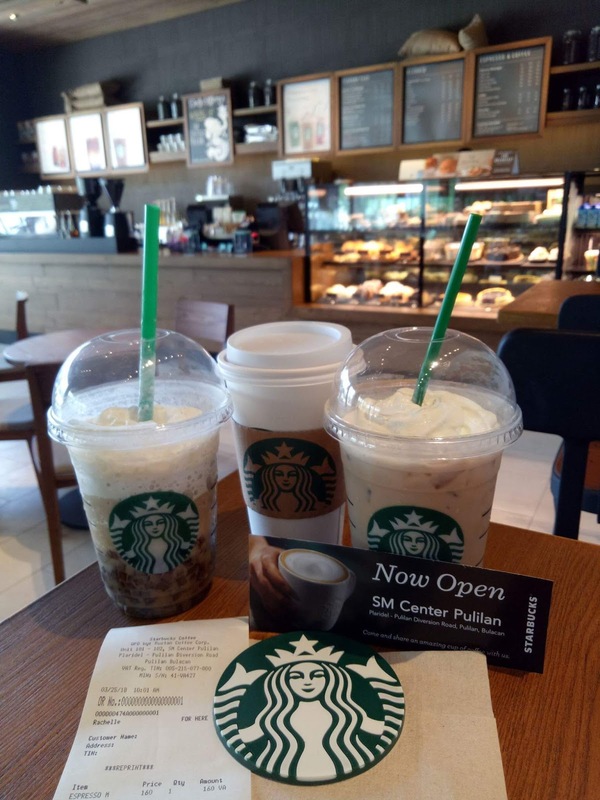 Bulakeños can now start their day by indulging in a perfectly fresh-­brewed cup of coffee at the newly opened Starbucks in SM Center Pulilan! Starbucks' first branch in Pulilan is the perfect place for coffee lovers to enjoy their high quality whole bean coffees before going to work, during business meetings, or simply chilling with family and friends. Starbucks offers - apart from coffee - a selection of premium teas, fine pastries, and other delectable treats. Nestled at the ground floor of SM Pulilan, Starbucks exudes a cozy- rustic setting to complement the sub-urban ambiance of the province. With rustic wood displays, brick walls, and big windows, Starbucks’ modern homey ambience will definitely be the perfect place to hang out. After all, since the first Starbucks opened in Seattle in 1971, it goes to work every day hoping to do two things: share great coffee with friends, and help make the world a little better. Visit Starbucks today at SM Center Pulilan. SCRAPES, SNOW PANDA AT SM CITY BALIWAG. Summer can bring on the warm weather as SM City Baliwag introduces two must-try frozen treats. Who can resist a blissful serving of hand crafted ice cream served and made before your very eyes? Scrapes, Philippine’s first 90% less sugar guilt-free premium stir- frost deli, is now opened at SM City Baliwag. Scrapes offers a hearty menu of guilt- free hand rolled ice creams. Toppings are varied and fun. Syrups, whipped cream, cookies, fruit and more are piled on to satiate every sweet cravings. Guests can try Scrape’s best sellers such as salted caramel remedy, green tea matcha madness and strawberry extreme. Also, dessert lovers can satiate their taste buds with Snow Panda’s Korean style ice cream, Bingsu. Snow Panda’s desserts are lip-smacking masterpiece; the powdery and milky snow texture of shaved ice will definitely beat the heat of summer. Try these cool sweet treats at SM City Baliwag. Also, Hypermarket in SM City Marilao, SM Center Pulilan and SM City Baliwag will be opened on Maundy Thursday and Good Friday. Operating schedules are from 8 am to 9 pm on March 29 (Thursday) and 8am to 7pm on March 30 (Friday) for SM Center Pulilan and SM City Baliwag. Meanwhile, SM Hypermarket in SM City Marilao will be opened from 9 am to 10 pm on Maundy Thursday and Good Friday. For updates, visit the facebook pages of SM City Marilao, SM Center Pulilan and SM City Baliwag. Your means of describing everything in this paragraph is genuinely good, every one be able to without difficulty understand it, Thanks a lot. My brother suggested I may like this website. He used to be entirely right. This post truly made my day. You cann't believe simply how a lot time I had spent for this info! Thank you!